In March 1851, Edward Hargraves wrote to the Sydney Morning Herald to announce that he had found payable gold just outside the New South Wales town of Bathurst. By 15 May over 300 diggers were in the area prospecting for gold and the Australian gold rush had begun. The following month further discoveries were made at Clunes in Victoria and later Warrandyte, Bunninyong and Ballarat. By the end of the year half the adult male population of the colony was at the diggings. With so many people leaving for the gold fields, many businesses found it hard to keep operating. Ship crews deserted, leaving vessels stranded in port, shepherds left their flocks, government officials, clerks, teachers and policemen left their jobs in the excitement. Soon they were joined by thousands of immigrants from Europe, America, China and New Zealand keen to try their luck. Between 1852 and 1861 over 342,000 people arrived, often enduring appalling conditions on overcrowded ships. Conditions were not much better on land as tent cities sprang up to accommodate the burgeoning population and the cost of food and necessities sky rocketed. Although there were some remarkable discoveries on the gold fields, few people made their fortune and most drifted back to towns and cities looking for work. Some of the immigrants returned to their countries of origin but the majority stayed. Australia ‘s first gold rush transformed the colonies. Convict transportation to the eastern colonies ceased, the population more than doubled, agriculture expanded and new industries were established. In these circumstances it is not surprising that the 1850s obsession with making a fortune at the diggings found its way into children’s games such as the Race to the gold diggings of Australia. The detailed colour illustrations reveal contemporary attitudes to the Australian gold rush. A circular track on the board simulates the journey by sea from England to Australia. Players must embark at Plymouth, make the hazardous ocean voyage, land at Port Philip [sic] and journey to the diggings. The winner is the first to arrive in Australia. Naturally there are large gold nuggets to be found as soon as the happy immigrants set foot on land. It is interesting that the miners’ clothing suggests that they have come from many parts of the world, not just England. The board shows prospectors digging while women and children gather outside their tents. Ships are anchored in a nearby bay, a stone’s throw from the gold diggings. 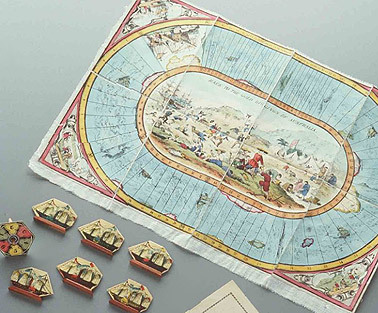 The game has historical significance as evidence of the romantic depiction of the voyage to Australia and the prospect of instant wealth that lured migrants to the colonies. It also reveals the limited understanding hopeful diggers had of Australia’s geography. The game has considerable interpretive potential. The Race to the gold diggings of Australia board game is a rare example of the movable heritage of the first Australian gold rushes, an event that transformed colonial society and laid the foundation of modern Australia. Annear, R 1999, Nothing but gold: The diggers of 1852 , Text Publishing. Blainey, G 1978, The rush that never ended: a history of Australian mining , Melbourne University Press.